Exercise: Advice from a "Fit Fella"
Falls are the most common reason for injury and loss of independence among older British Columbians. However, the majority of falls can be prevented. One of the best ways is by improving your strength and balance through physical activity. According to Health Canada (2016), only about 11% of older men meet recommended guidelines for physical activity. 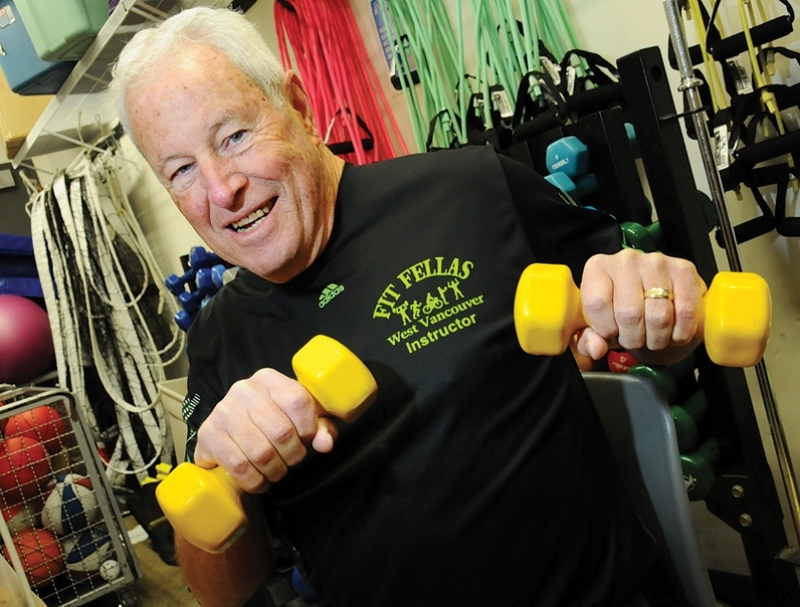 Among that physically active 11% are 190 older men, known as the Fit Fellas’—the largest, longest running and most successful fitness program in the District of West Vancouver. This group started in the late 1970s as an initiative to get its 8 original members moving. Since then, Fit Fellas’ has grown significantly, both in membership and number of class offerings over the last 43 years. Fit Fellas’ youngest member is 64 years old and the oldest is 99, with an average age of 76, defying the national trend of physical activity decreasing while age increases. Barrie Chapman, program manager and volunteer instructor with Fit Fellas, has some tips for older men who want to increase their levels of physical activity. Q: What would you recommend for an older man who wants to go from being a ‘fella’ to a ‘fit fella’, but might not be close to West Vancouver? A: Most areas have community centers, YMCA’s and/or private health facilities that offer a variety of fitness programs for older adults. Ask your doctor if you are healthy enough for physical exercise and if they will recommend a suitable resource in your neighbourhood. Talk to your friends that exercise and then go and check these places out. Don’t be intimidated by a room full of fancy equipment or a gym full of people you don’t know. Don’t be shy—it’s your health and your future. Talk to the staff, tell them about your personal objectives and your medical status and ask them to recommend and help you get started in a program. Then, make it a daily habit. Mornings are best because you get out of bed and go for your workout. After that you have the rest of the day to do your other chores and activities. Finish the day off with a brisk walk before supper. Q: What are some perceived barriers to physical activity, and how have some Fit Fellas overcome them? A: I think the biggest barrier, other than physical or medical limitations, is fear. Men are not normally “joiners” like women are. They have those male egos that they have to uphold that say they are strong and tough and exercise in a fitness class to music is for sissies. Well boys, think back to those early dance classes in high school when you had to learn to dance with (heaven forbid) a girl. Then you found that cozying up to one of those girls was fun. I suggest you give this fitness stuff a try because you’ll find its fun too. Maybe not as much fun as those early dancing days but at your age, this stuff is better for you. It will keep you moving, keep you flexible, keep you coordinated, keep you strong and keep you healthy. Q: How closely linked is the frequency of cinnamon bun consumption to the success of the Fit Fellas? Always choose activities that you enjoy! Remember to ask your doctor, physiotherapist or health care provider about the best type of exercise program for you. Fit Fellas’ meets Tuesdays and Thursdays in West Vancouver. Click here to sign up today!